Lilley Developments formed a joint venture with Burrell to pursue major mixed use projects in Scotland. With the might of the Lilley balance sheet, and the vision and local knowledge of Burrell, the Company seemed destined for great things. Alas collapse followed Lilley's bankruptcy in London. The effect upon Burrell was catastrophic, but not lethal. Fettes Village was half built when the company ceased trading. 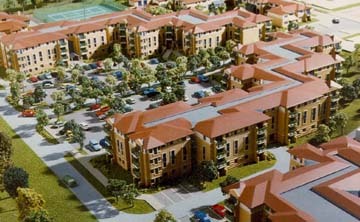 A scheme of flats, houses and a leisure centre, the original plan had been designed by retirement home developers, McCarthy and Stone, who sold the site on having started the foundations. The aesthetic was reviewed as were the internal plans. Davis Duncan Architects were retained to carry out the work. Ultimately half of the scheme was undertaken by another developer to a significantly cheaper spec.